This Psalter is named after one of its owners, John Grandisson, who was bishop of Exeter from 1327 until his death in 1369. It was adapted for his use, having originally been made for someone who perhaps lived in the area of Chichester. 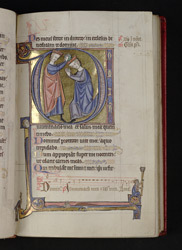 The anointing of David by Saul is a not uncommon image in historiated Psalm 26 initials in medieval English Psalters. The decoration which extends into the lower margin is characteristic of the third quarter of the 13th century. The line of music on four-line red staves is later, an addition perhaps made for Bishop Grandisson.